Komodo Island is named for the Komodo dragon, a very large lizard, which inhabits the island. Komodo dragons have shark-like teeth and poisonous venom that can kill a person within hours of a bite. The following steps can be taken to avoid an altercation with the Komodo Dragon. Always travel with a knowledgable tour guide. Carry a weapon at all times, like a sizable knife or dagger. Komodo dragons don't see well at night, so travel is safer after dark. Komodo dragons are excellent swimmers, so don't seek water to escape. 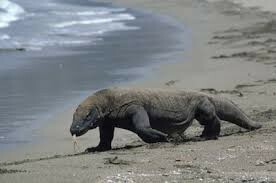 Komodo dragons are very fast movers, so don't attempt to run to escape. If attacked by a Komodo Dragon, punch it in the snout or stab the animal until it releases you. If bitten, get medical attention right away. The bite of a Komodo Dragon is poisonous, and can kill humans quickly. 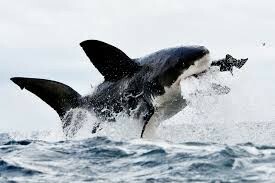 The Great White Shark lives near the shore. It is capable of short bursts of speed while in pursuit of prey. It can breach (launch itself clear out of the water) if necessary. The following steps can be taken to avoid an altercation with the Great White Shark.